COMMENT: Although we have discussed it frequently over the decades, recent comments by Trump disparaging Haiti as a “shithole” country and pining for immigration from Norway instead warrant a fresh look at the Crusade For Freedom. During Trump’s brief tenure as President, the media have consistently lamented his actions as idiosyncrasies. Trump’s policies are not his alone, but follow in a linear path, along which the GOP has traveled for decades. In this post, we review the Crusade For Freedom–the covert operation that brought Third Reich alumni into the country and also supported their guerrilla warfare in Eastern Europe, conducted up until the early 1950’s. Conceived by Allen Dulles, overseen by Richard Nixon, publicly represented by Ronald Reagan and realized in considerable measure by William Casey, the CFF ultimately evolved  into a Nazi  wing of the GOP . “. . . . Vice President Nixon’s secret political war of Nazis against Jews in American politics was never investigated at the time. The foreign language-speaking Croatians and other Fascist émigré groups had a ready-made network for contacting and mobilizing the Eastern European ethnic bloc. There is a very high correlation between CIA domestic subsidies to Fascist ‘freedom fighters’ during the 1950’s and the leadership of the Republican Party’s ethnic campaign groups. 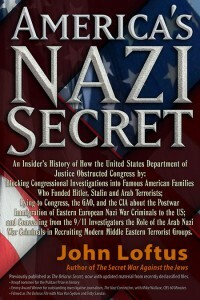 The motive for the under-the-table financing was clear: Nixon used Nazis to offset the Jewish vote for the Democrats. . . .
. . . . In 1952, Nixon had formed an Ethnic Division within the Republican National Committee. Displaced fascists, hoping to be returned to power by an Eisenhower-Nixon ‘liberation’ policy signed on with the committee. In 1953, when Republicans were in office, the immigration laws were changed to admit Nazis, even members of the SS. They flooded into the country. Nixon himself oversaw the new immigration program.AsVice President, he even received Eastern European Fascists in the White House.. . .
2. More about the composition of the cast of the CFF: Note that the ascension of the Reagan administration was essentially the ascension of the Nazified GOP, embodied in the CFF milieu. Reagan (spokesman for CFF) was President; George H.W. Bush (for whom CIA headquarters is named) was the Vice President; William Casey (who handled the State Department machinations to bring these people into the United States) was Reagan’s campaign manager and later his CIA director. 3. While serving as chairman of the Republican National Committee, the elder George Bush shepherded the Nazi émigré community into position as a permanent branch of the Republican Party.
. . . . . It was Bush who fulfilled Nixon’s promise to make the ‘ethnic emigres’ a permanent part of Republican politics. In 1972, Nixon’s State Department spokesman confirmed to his Australian counterpart that the ethnic groups were very useful to get out the vote in several key states. Bush’s tenure as head of the Republican National Committee exactly coincided with Laszlo Pasztor’s 1972 drive to transform the Heritage Groups Council into the party’s official ethnic arm. The groups Pasztor chose as Bush’s campaign allies were the émigré Fascists whom Dulles had brought to the United States. . . .